The following post is written by coach Suzie Richards. The alarm went off this morning at 5.45am. I got out of bed, pulled my swim costume on, tried to find clothes that may match, in the dark this is always harder than I realise. (I feel I am being a considerate girlfriend for not turning the light on. Though I do regret this, when I arrive at the pool, with clothes that clash). I give my self an imaginary pat on the back, as I dive into the water. It is a bigger deal, than you may realise. Rewind 3 weeks ago, the alarm would go off, I would roll over, turn it off and go back to sleep. I lacked motivation, I felt washed up, burnt out. The training dairy became red, sessions left undone, I had no va va voom. I got upset, I got frustrated, why was I so tired? I had raced once, way back in March, in Lanazarote. You can read more about that here. And then I underwent surgery on my heel. I hadn't trained for 12 weeks. I then started cycling and swimming, but with little volume and low intensity. I don't need a break. I've had a 5 month break I thought. I was wrong. I needed a break, not just from swim, bike, run but from rehab, from thinking about my heel, from looking at a training diary, from believing I should be doing some training, but mainly I needed a break from thinking about Triathlon. So last week I went to Spain. My mum lives out there, it was a good excuse to pack some books, sun cream and arrive with no plans. We had a good few days, picking vegetables from her allotment, snorkelling in the sea, walking in the mountains and reading. I then headed off south on the train to Totana, to spend a week at Rustic Retreats, a environmentally friendly, off grid yoga retreat. I spent a week living under canvas, eating incredibly fresh healthy food, cooked by the skillful Elliot, practiced meditation and yoga for 2 hours each morning and evening and learned about Yoga philosophy, Chinese medicine, energy systems, the seasons and much more in a whole host of workshops. I got to know the 11 other yogi's and learnt a lot from the brilliant Yoga teacher Bec Black, who's philosophy 'It's all about the Balance' was central to the week. Everyone's idea of a 'break' and a 'holiday' is different. For me, this was perfect. I knew it was exactly what my mind and body needed right now. I knew I needed to spend time in a completely different environment, I needed to be kind to myself, to energise and nurture myself. Triathlon is tough, I think I often forget that. Getting up early to swim 5 times a week, riding and running in all weathers, going to the gym, eating well and while trying to be the best girlfriend, friend, daughter, sister, employee I could be. I needed to take a break, and take some time to focus on the Niyamas, one of Patanjali's 8 limbs of Yoga. The Niyamas include, self care and health. I understand a Yoga retreat is not for everyone, a trip to Spain is not possible for everyone. But I do whole heartedly believe, taking a 'break' whatever that maybe is definitely beneficial for everyone. Taking time away from swim, bike, run. Time away from looking at your training diary, from looking at potential races, from the ' normal routine', is I feel vital for a healthy mind and body. I am not advocating for triathletes to sit on the sofa, eat rubbish and put on weight. I do not think this falls under 'self care'. For me, I think finding a balance, feeling refreshed, physically and mentally and being kind and caring to yourself should be central to the idea of ' taking a break' and the 'off season' . When should I take a break? Your mind and body will know when you need a break. A beneficial way of using your break is to reset your body and sort out any niggles and injuries. Coach Suzie and Sarah Pitts from MostMotion have joined forces to create "October reset your body- Mobility, Strength and Conditioning". A series of 5 S&C videos, specifically for triathletes to understand their areas of tightness, imbalances and weaknesses. You can read more about it and sign up here. Remember Team Oxygen Addict members get £10 off. I am a big fan of the Podcast "Finding Mastery" hosted by Dr Michael Gervais. Each week Michael sits down with an expert from a whole range of backgrounds to discuss their ideas around mastery and how they became an expert in their field. Last week's podcast was with Shaka Smart, the Men's Head Basketball coach at The University of Texas. Shaka talks about many leadership and coaching skills, the one I will focus on is feedback. "You need a healthy and close relationship with feedback to progress. Being open to feedback is imperative for growth." Shaka discusses the many forms of feedback and the different ways of responding to it. He mentioned that feedback is often right there in front of you, you just need to open your eyes to see it. It reminded me of my first Job. I was teaching Geography in London, on the Teach First programme. At the end of each day, Comfort, the cleaner, would come into the classroom, scan the room and look at me. I was usually lying on a table, thankful I had survived the day. From the state of the room, Comfort knew how my day had unfolded. 32 paper aeroplanes,scattered on the floor, made out of the worksheets I had designed at 2am the previous morning, enough crisp packets and chocolate wrappers to show a huge picnic had occurred rather than any learning about waterfalls or glaciers. It gave pretty clear feedback. This was the general theme, every single day. I will remember the day, several weeks into my first term. Comfort came into the room and the floor was free of crisp packets, drinks cans, screwed up work sheets, chocolate wrappers, chewed stationary. We whooped with joy, danced around the room together and celebrated with hi-fives. "Your classroom is a mirror of yourself"
Was one of the most valuable pieces of feedback I have ever received. How does this relate to Triathlon, and Shaka's comments regarding sport and feedback for athletic development? Shaka commented that often the feedback is right in front of you, sometimes it just requires pointing out. This links in with another podcast interview I listened to recently. The Tri Specific, Fat Black podcast #223 with Brad Kearns. Brad discusses the ideas of preventing burn out, loss of motivation and keeping healthy through taking on feedback from your body. Unable to get up in the morning? lacking motivation to follow the training program? Tired every evening as you collapse onto the sofa? This is all feedback, saying "Give me a break, stop hammering me!" The other week, I took my GoPro to the Club Triathlon club swim session and offered to film people's swim stroke. Watching the footage in slow motion really highlighted how technique could be improved. I tested the GoPro out on myself first. Here are some stills from my swim. amount of my swim cap is under the water, is this the most efficient head position? Seeing my swim stroke allows me to consider how I can make it more effective and efficient. suggestions of how I could improve. Shaka, discusses how feedback is received and how athletes hear and implement feedback. feedback rationally, therefore avoids becoming personally upset or feeling attacked. average power for a 20 minute cycle time trial. It can be a coaches analysis on your swim stroke. It could be a physio's mobility assessment of what movements you can or can not do. The list is endless. The key to progression, is to embrace feedback, hear it and to act on it. How can I get better at swimming? Coach Suzie Richards details some really useful ways that you can use simple but very effective techniques to rapidly improve your swim times. I was coaching a Leeds Bradford Triathlon Club swim session last week. One part of the session was 9 x 100m off 2 minutes. This was to be done as 1- 3 descending, repeated 3 times. I was saved by Tony. "I think I did that one in 1.45"
Great, so if your easy 100m was 1.45, then I suggested Tony make the medium 100m a 1.40 and the hard 100m a 1.35 .10 seconds minimum between the easy and hard 100s is a nice clear distinction in different paces. There is a big wall clock at the pool, ideal for timing reps. I asked all the athletes to use it. After using the clock Tony who had hit 1.45 for his easy rep, then hit 1.44 for the medium rep and 1.44 for the hard rep.
Bingo, the next set of 3 x 100m saw a clear distinction between easy, medium and hard. As the athletes left the pool, I suggested they write down their times in whatever training diary they used. Why is recording your times in a diary a good idea? The number 1 reason is to keep track of progress. If you swim 9x100m in January and then every other week or do a similar session then you can see if you are improving. 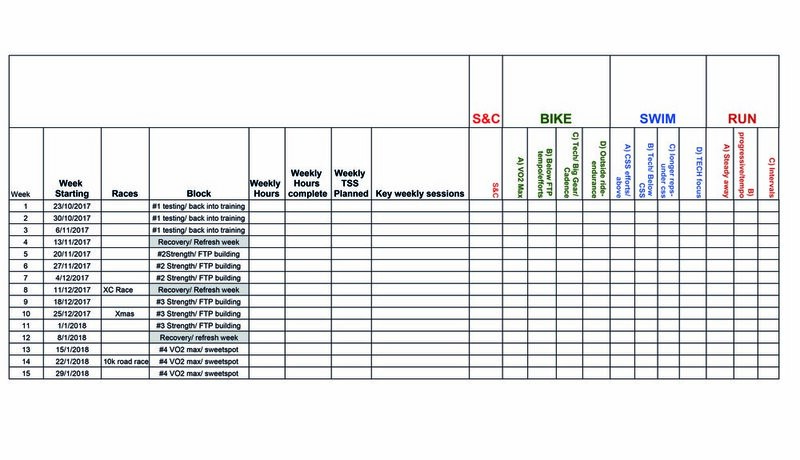 A training diary that shows your times and distances is useful to show you if you are improving. If you are swimming the same times in July as you were in January, you must be doing something wrong. The athlete in example 1, can see good progress in their swimming. So can take confidence in what they are doing is working and is likely to be motivated to continue. The athlete in example 2 can see that in over a month, they have made limited progress. They can step back, reassess their training plan and make changes. One of the athletes at the Triathlon Club swim told me he logs all his training on Strava. I was intrigued to know how he logged his swims. He told me he puts total distance swum and time. Now I use Strava sometimes, mainly for uploading rides, I think it has some good benefits, comparing your hill rep efforts or 5 minute reps on the same segment each month is useful. But for swimming, I struggle to see the benefits, outside of logging time/ distance swum. You could have a Strava diary filled with 4 swims/ week but over 3 months your 100m times in a 16 x 100m session maybe the same and that is not transparent to you. A useful function of Training Peaks is the search tool, that allows you to search through different work outs and allows you to compare them. I like to title work outs, in a way that allows me to easily find them using the search tool, which allows me to compare them. Here is an example. If one swim each week, is a distance rep session then you can compare how you are progressing, through using the search tool and viewing them in a list, such as bellow. A really simple, but key, component to improving your swim times, is to use the clock and record your times. Just by recording your times, you'll focus your mind on improving. What gets measured gets improved!